UIIC Admit Card 2017: UIIC has released the admit cards for the prelims examination. This year, the UIIC exam is taking place to recruit eligible candidates to fill 696 vacancies for the post of Assistants. The UIIC Prelims exam is scheduled to take place in 22nd Sept 2017. The UIIC Admit Card is now officially available and candidates can click on the direct link mentioned in this post and can download the UIIC assistant admit card. We advise all our candidates to download their copies of UIIC admit card at the earliest to avoid any problems. We have given you the complete illustration of how to download the UIIC admit card for Assistant 2017. From preparation point of view, you can attempt online UIIC mock tests & previous year question papers evaluate your performance. UIICL or United India Insurance Company Limited is a leading Public Sector General Insurance Company owned by the Government of India with a gross premium of more than Rs. 16,000 Crores. It has more than 2100 offices and has the highest network of non-life insurance industry throughout the country. UIIC proposes to recruit ASSISTANT’S throughout its offices all over India. UIIC invites applications from all eligible Indian citizens for the post of Assistant. The UIIC Assistant Post has a total of 696 Vacancies across India, details of which are given below. 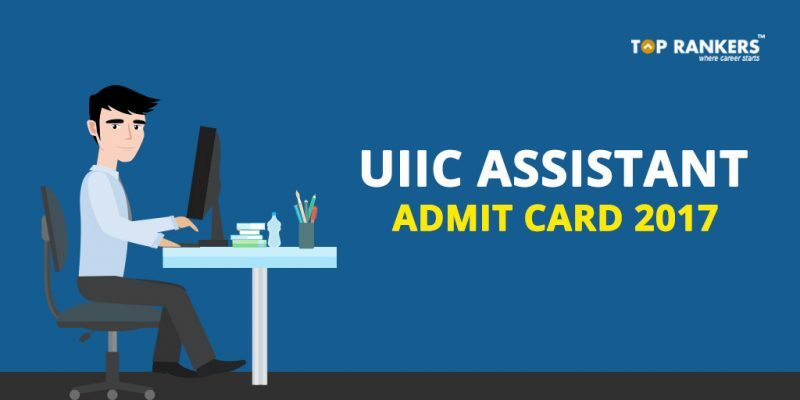 How to Download UIIC Assistant Admit Card 2017? Click the Direct Link given above in this post. Choose to option of providing your login credentials in either Hindi/ English languagee. You must have received a registration number during the registration process. Enter the registration number. Make sure you enter your date of birth as per the prescribed format or set your password as received (or set) by you during registration. Enter the captcha code and verify. Try to download your copy of the UIIC prelims Call Letter as soon as possible in order to window closure date to avoid technical glitches. Alternatively, go through the Official UIIC website & click on the suitable link to download your UIIC Admit Card. Carry the admit card to the Examination hall. Candidates who do not carry admit card will not be allowed to enter the examination hall. Candidates must preserve a few photocopies of their admit card. It is also mandatory to carry valid Photo ID proof issued by government like Aadhar card, PAN Card, Drivers license to establish identity. Candidates must also carry 2 passport size photograph. Stay tuned for more updates on UIIC Assistant Admit card 2017!